When the Lord rode a donkey toward Jerusalem, He was fulfilling the prophecy from Zechariah (9:9), “Behold, your King is coming to you; He is just and having salvation, lowly and riding on a donkey, a colt, the foal of a donkey.” The people welcomed the Lord as their King, spreading a carpet of clothes and palm branches along the way. They shouted, "Hosanna," which means "save us now". The Lord came on earth because He loves us and without His coming, no one could have been saved. By fighting and defeating the hells and by making His Human Divine, the Lord became the Savior and Redeemer. The story of Palm Sunday pictures the way we can look to the Lord, praising Him and asking for His help to conquer our evils. Read and compare several different accounts of the Palm Sunday story to get a clearer picture of the excitement people felt as they greeted the Lord as their King. Note the events that come right before and after this story in each gospel. How do these give us a fuller idea of the Lord’s mission on earth? Do they suggest ways that He would like to help us spiritually? What did people do when they saw the Lord coming? (They spread clothing and palm branches on the road before Him.) People were greeting the Lord with their customs for greeting a king. The people said “Hosanna!" as the Lord entered Jerusalem. The word “Hosanna” means save now. The joy of this story is quickly followed by the sorrow of the Lord’s arrest, trial, and crucifixion. But we can embrace His resurrection with joy, knowing that He became our Savior and Redeemer. A video told directly from the Word, illustrated with felt figures and suitable for young children. An illustrated story about the people of Jerusalem welcomed the Lord with palm branches. Palm Sunday is a day for great rejoicing. Christians all over the world think about the Lord and how He came into the world to save people. The story of the Lord’s last days on earth is one of joy, then of grief, and then again of joy. 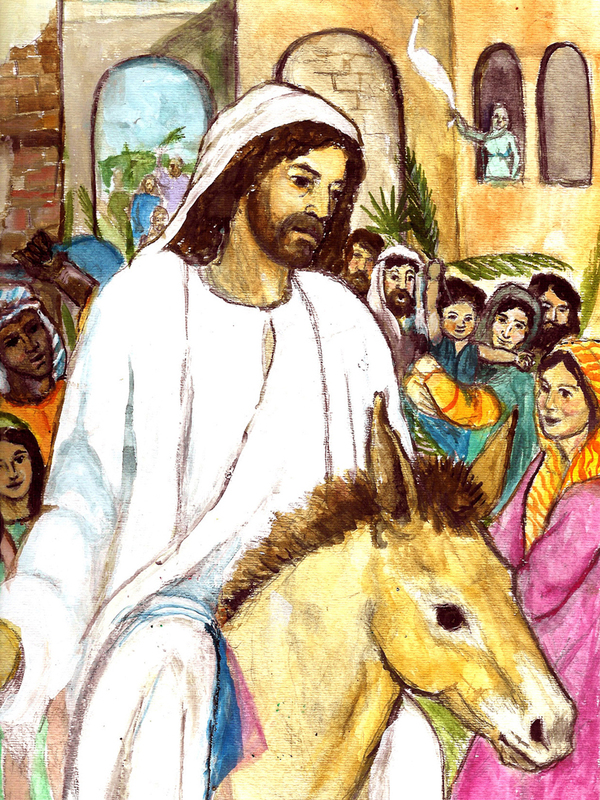 This story imagines what a boy named Josiah might have seen on the first Palm Sunday. Children can color the picture of the Lord, then glue on scraps of cloth and small leaves. Illustrates the Lord entering Jerusalem as people greeted Him with palm branches. Shows people welcoming the Lord with palm branches. This is a jigsaw puzzle to print on stiff paper, cut out, and then assemble. Act out the story of the people of Jerusalem welcoming the Lord as a narrator reads Matthew 21:1-11. A picture of the Lord's journey from Bethphage at the Mount of Olives toward Jerusalem. A description and pictures of the reenactment of the Palm Sunday procession that takes place every year from Bethphage to Jerusalem. A lovely picture in 3 panels to color and then assemble as a triptych for display in your home. Sign up to receive notification when new highlights like this are published. Subscribe.